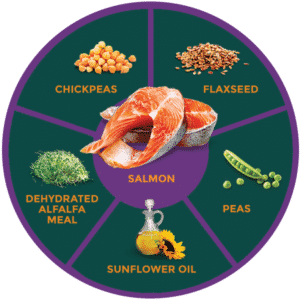 Our Salmon Formula is loaded with heart healthy Omega-3 fatty acids. These fatty acids lower blood triglyceride levels, which in turn lowers overall body fat. Salmon is also packed with lean protein for building lean muscle mass and maintaining strong bones. Our Salmon Formula is completely grain free, and that can help with dogs that have food sensitivities or allergies. We also include plenty of antioxidants and low glycemic carbohydrates for a healthy, satisfied dog. Zignature® Salmon Formula – Learned from Nature, Crafted to Perfection.